The human body is always attempting to maintain homeostasis or balance, and for this reason, many medications that are taken for a long period of time cause the body to adapt and change. Therefore, stopping a medication, like clonazepam, abruptly can sometimes unbalance the system and can lead to uncomfortable and possibly dangerous withdrawal symptoms. Some medications are more likely to be problematic when stopped abruptly than others are. Among those likely to cause problems are antidepressants, antipsychotics, mood stabilizers and anti-anxiety medication. Withdrawal symptoms are common in this situation and generally are opposite in nature from the drug’s actions and similar in nature to the original condition for which the drug was taken. Flu-like symptoms are also common withdrawal effects from many substances. Antidepressants – Withdrawal from antidepressants can cause insomnia, confusion, anxiety, panic, agitation, nightmares and worsened depression. People may also experience fatigue, nausea, vomiting, dizziness, muscle spasms, headaches and loss of coordination. Antipsychotics – Abrupt discontinuation of antipsychotic medication can lead to anxiety, involuntary muscle movements, neuroleptic malignant syndrome, parkinsonian symptoms and a severe relapse of psychotic symptoms. Lithium – When abruptly discontinued, people who have been taking lithium to stabilize moods may experience mood instability and a relapse of mania. Benzodiazepines – Benzodiazepine drugs, often prescribed for anxiety disorders, can cause serious withdrawal symptoms including seizures, tremors, hallucinations, heart palpitations, insomnia, nausea and increased anxiety. It may be difficult to determine the nature and extent of the condition for which the drug was originally prescribed. As noted, abrupt discontinuation of many medications leads to withdrawal symptoms that mimic the underlying condition for which the drug was taken. This can make it very difficult for both patients and their healthcare providers to determine the patient’s true health status. This, in turn, makes the best course of treatment difficult to know. If the medication must be re-started, time can be lost. Many mental health medications work by balancing neurotransmitters, which can take time to build. It can take four weeks or more for antidepressants to change brain chemistry to the extent that symptom improvement is noted. If drugs are stopped abruptly and then need to be resumed, there may be a gap of weeks to months where symptoms are not being effectively treated. The body is an interconnected system, and imbalance in one area can lead to problems in others. Some health conditions are more difficult to address in patients with untreated depression, and when patients are taking multiple medications, abruptly stopping one can lead to an imbalance and improper dosing of others. Mental health conditions and addiction often co-exist, and when mental health symptoms rebound, the substance abuse and addiction risk may rise. 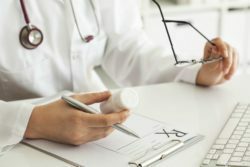 The best tapering schedule for any given individual will vary based on the drug, current dosage, length of time on the medication and personal health history. This is why it is extremely important to always be under the care of a supervising physician when adjusting any medication. Symptoms should be continually monitored. If an increase in symptoms is seen after a dosage reduction, it may be wise to add back half of the dose that was decreased. Other options may include switching medications within the same class to better manage withdrawal. If you need treatment for addiction to drugs like clonazeapm, or for co-occurring addiction and mental health conditions, we can help you find the assistance you need. Our helpline is toll-free and available 24 hours a day at 706-914-2327. Our knowledgeable and compassionate admissions coordinators understand the issues and can answer your questions. They can help you understand your treatment options and can even check your insurance coverage for you if you wish at no cost or obligation. There is never a wrong time to call, so why not call now? 1 "Tolerance, Dependence, Addiction: What's the Difference?" NIDA for Teens. 12 January 2017. 2 "How to taper off your antidepressant." Harvard Health Publishing. 2 April 2018.